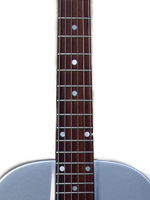 A three piece unbound mahogany neck with the centre section extending through the body to the tailblock and featuring an adjustable truss rod. 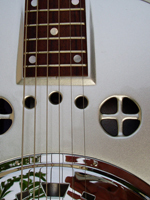 The neck is carved to suit the customer's requirements, based on a 24 ¾ scale length. 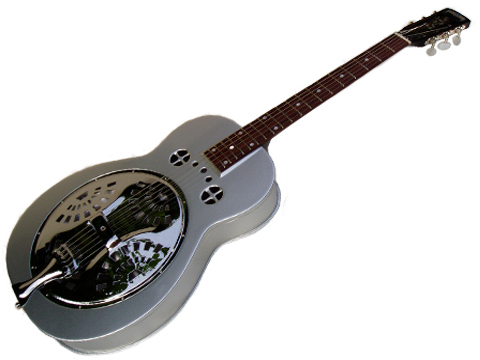 Re-created in wood to capture the tone and looks of a classic 1930 spider style instrument . 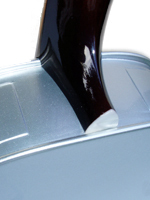 Options including neck profiling, left handed versions and a range of colours/finishes. Guide Price £1795 including hard case. 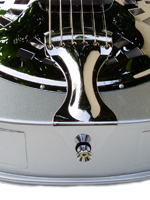 All of our instruments are built by hand. We continually strive to improve all aspects of their quality and performance. With this in mind, please be aware that we reserve the right to change specifications without notice. 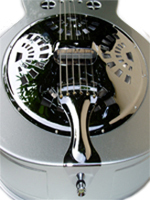 Cover plate can be plated or painted the same colour as the guitar. Constructed from a traditional design. 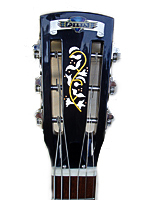 Slotted headstock with optional Inlay (Extra)Grover or Schaller machine heads. Birch Laminate with Fiddle Edge Design and Embossed Sides. 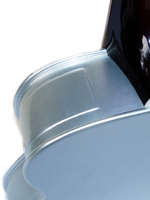 Solid or Metallic Colour, plus left handed versions.